Thermometers of this design are well adapted to installation on top of tanks, boilers, in high locations or other areas where it would be difficult to read a standard angle-form instrument. Stems are 1/4" in diameter. Stem lengths up to 36" can be supplied. 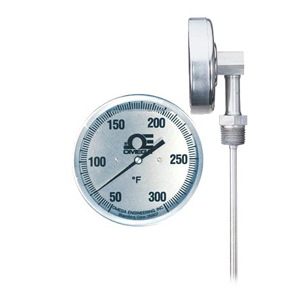 Normally supplied with the stem at the BOTTOM (6 o’clock) position, on special order, these thermometers can be set with the stem protruding at the LEFT (9 o’clock), TOP (12 o’clock) or RIGHT (3 o’clock) positions. If not specified, the standard BOTTOM (6 o’clock) position will be supplied. 20-240F temperature range, 4 1/2" stem length. 20-240F temperature range, 18 1/2" stem length. -40-70C Temperature range, 15 1/2" stem length.